Thats my project this week. I thought about making something for P or J, but they have so many clothes that they are spilling out of their drawers. My next option was to make something more for winter baby, but I've gone through all my newborn stuff, and I think I've got enough for him or her. So that just leaves me! So my project this week is to make something wintery for myself. Probably should have started before the girls got back from DH's parents. We had P's 4th birthday last week, and it was lovely. It was a big week, with several family members visiting and staying during the week, and a party on the weekend. 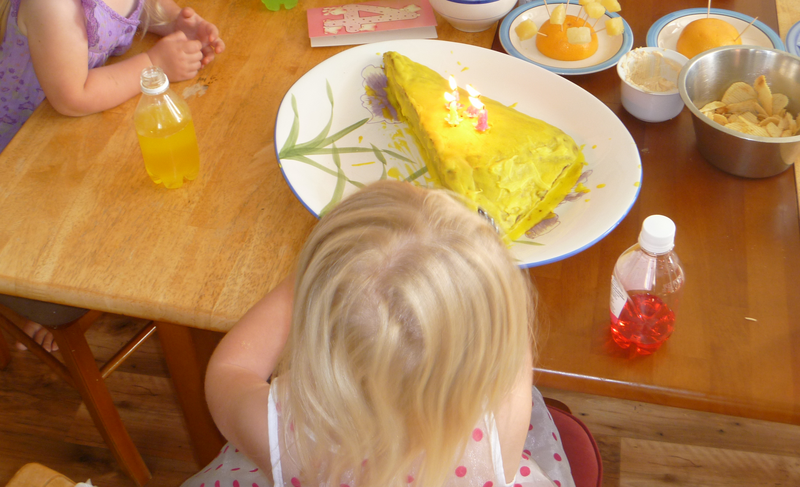 She asked for a triangle cake with yellow icing, and was spoilt by presents from her friends and family. Things have been a bit busy here in real life, so blogging has taken a bit of a back seat. But P and J are with their Grandparents for a couple of days, so I'm hoping to catch up on a little bit of blogging. First things first: the last of P's birthday presents. The week before last (ie a week before P's birthday) I suddenly realised that I needed to sew all 26 of my fabric letters for her alphabet present. This lead to a week of frantically sewing all evening to get them done. In the interests of full disclosure, I do have to confess that sewing all evening means until about 9pm, and then I go to bed. I read about women who stay up to the wee small hours to complete projects, but I just can't function on that little sleep (even when I'm not pregnant). I had gotten as far as roughly cutting out the patterns, and pinning all the fabric together, when I realised that I would either have to a) cut all the letter patterns out much more carefully and draw around them before sewing or b) sew over the paper and hope I could rip the paper off perforation styles after sewing. I think you can probably guess which solution I went with. The sewing machine coped fine with the paper - it needed a little coaxing, but not too much, and surprisingly the perforated paper also came off really easily. The only thing I would change about the alphabet is some of the fabric I used for the front of the letters. Most of them are fine, but a few are too busy and detailed, which makes it harder to work out which letter they are. If I do it again, I will go for more solid colours, with less details. And a little alphabet trivia, which four letters can be represented by one symbol turned different ways? I'd love to say these were P's favourite birthday present, but that would be a lie. Her favourite present was actually her fishing rod, but more on the birthday stuff in my next post. Lets talk about failures shall we? I've had a few in my crafting adventures, and I'd like you all to know that everything doesn't stay as great as it looks on my blog. These finger puppets came undone pretty quickly after I made them. These ones too - one of the eyes got all long and googly as well. To be fair P and J don't really care that much about that. P just doesn't wear this singlet, even though she quite likes it. It's too tight. And so it sits in the drawer all forlorn. J took one look at these smocks from Father Christmas, and flat out refused to even try them on. Despite much coaxing I think she has worn one once, and they have been put away with the summer clothes in the hopes that maybe next summer she will have gotten over her dislike of them. And lets not forget the skirt I made myself that I had to relegate back to the sewing box because it was such a bad fit. Looking at it again I think it'd make an awesome pencil skirt though. Long time readers of my blog will note that there are no Montessori activities on my projects this year, and the reason for this is simple. They have been a really big failure. Now to be fair, I knew at the start of the Montessori journey that we were unlikely to stick fully to the ideals, but I did hope that we would make it work anyway. It did not. As much as the girls enjoyed doing the activities, they lasted for about 2 days. And try as I might, we just couldn't keep them tidy and in order (well I couldn't keep them tidy and in order). So when we rearranged the girls room recently, I gave up and relegated the shelves to the spare room. As much as I really really want to do these, it just hasn't worked for us. Rather more than one failure to share with you. For me its important to show the reality of my crafting. Although there are plenty of things I make that work out really well, and are very well received, there are some that just don't cut it. So next time you read about something amazing I've created, just remember that there are no guarantees it will work, or that the recipients will appreciate it. For all that, I still enjoy making things, even if they don't work out. Last year, I knitted some lovely eggs for P and J for Easter, but this year I completely forgot that Easter was coming up at all (I know, I saw all the other posts on people's blogs, but it just didn't register). So when I saw this post by Rosy-Posy, I thought it would be a great little project for P and J and I to do this Easter. I've had some roving that DH's Nan gave me. She used to spin, but has given it up (more because of time constraints than infirmity - this is the 80 year old who still skis! ), so I thought this would be a great opportunity to try our hands at wet felting. The first part of the process was to dye the roving (more on this next post). Because this was also the first time I'd tried to dye roving, I decided to make the chicks so that I only had to dye one colour. We followed the process as outlined by Rosy Posy, although our chicks aren't quite as smooth as hers ended up. I did most of the wrapping myself because it was tricky for P and J to wrap the roving around in a ball, but P did all the wet felting herself. As this was the first time I'd wet felted anything, I was a little worried about the length of time it was taking for the balls to felt down. But we stuck with it and ended up with some very cute little yellow balls. I was really proud of how well P did (J was much less interested in the whole wet felting process). Once they were completely dry (thanks to the hot water cupboard), I embroidered on a little orange beak, and used a permanent marker to make the little eyes (I don't have any black thread). For my Easter Chicks project with the girls, I needed some yellow roving to felt. So I decided to try dying some myself. My biggest concern was that the dyeing process would felt the roving, so I was extra careful in my process. It is essentially the same as when I dye wool. 1) Soak the roving in cold water and vinegar for several hours or overnight. I used about 1/2 cup of vinegar, but you can use up to half and half. Using the vinegar in the soak helps the roving to take the dye quickly, which helps prevent felting. 2) Heat water and vinegar in the slow cooker until it starts to steam. I added some of the soaking liquid, and then about another 3/4 cup of vinegar. Again, the more vinegar the quicker the dye will be taken up. If you're using a non primary colour (or a mix of colours) more than 3/4 cup of vinegar will make the colours take up at different rates and can lead to some variegation that you didn't intend. 3) Turn the slow cooker down, add the roving pushing it down into the pretty hot liquid. 4) Add the dye (I used yellow food colouring because it's awesome). Poke the roving gently to ensure dye gets on everything. 5) At this point I turned the slow cooker off, and left the roving sitting in it. You can leave it until it cools down, but I can never wait that long - it needs to be in there for long enough to soak up as much of the dye as possible. Poke it as little as possible. 6) Rinse the roving gently in cold water - again be very gentle during this process, and don't add any detergent. I erred on the side of less rather than more washing, so when we felted our chicks, quite alot of yellow came out. Since I only use non toxic dyes this isn't an issue for us. 7) Spread out your roving on a towel and leave to dry. Enjoy your beautiful hand dyed roving in your next project. Although there are a few steps, its actually really easy, and so satisfying. We managed to get the garden cleaned up ready for winter, we just need to put some compost down, and sow some oats. We sow oats and then once they come through, we dig them back into the ground to help condition the soil. But our gardening also uncovered a surprise. I asked P to help me dig up some self sown potatoes (to keep her out of the way), and when she did, there were so many potatoes down there that we got several meals out of them. They are some Maori potatoes that we planted out a couple of years ago, and it has encouraged DH to consider growing some more, because they are just such lovely potatoes to eat. So far, the Grenada is the only one that I'm not so happy about. Its what I expected, but it just doesn't really grab me like the other two colourways do.